The long-held theory of how humans first populated the Americas may have been well and truly broken. Archaeologists have unearthed thousands of stone tools that predate the technology widely assumed to have been carried by the first settlers. The discoveries in Texas are seen as compelling evidence that the so-called Clovis culture does not represent America's original immigrants. Details of the 15,500-year-old finds are reported in Science magazine. For 80 years, it has been argued that the Clovis culture was the first to sweep into the New World. These people were defined by their highly efficient stone-tool technology. Their arrow heads and spear points were formidable hunting weapons and were used to bring down the massive beasts of the Ice Age, such as mammoth, mastodon and bison. The hunter gatherers associated with this technology were thought to have crossed from Siberia into Alaska via a land bridge that became exposed when sea levels dropped. Evidence indicates this occurred as far back as about 13,500 years. But an increasing number of archaeologists have argued there was likely to have been an earlier occupation based on the stone tools that began turning up at dig sites with claimed dates of more than 15,000 years. Dr Waters and colleagues say this position is now undeniable in the light of the new artefacts to emerge from the Debra L Friedkin excavation. These objects comprise 15,528 items in total - a variety of chert blades, bladelets, chisels, and abundant flakes produced when making or repairing stone tools. The collection was found directly below sediment containing classic Clovis implements. The dating - which relied on a technique known as optically stimulated luminescence (OSL) that can tell how long minerals have been buried - is robust, says the team. And, they add, the observed sequence is also reliable; the sediments have not been mixed up after the tools were dropped. "The sediments were very rigid in the fact that they were clay, which worked to our advantage," explained Lee Nordt from Baylor University. "If you go to many other sites, they are loamy or sandy in texture, and they are mixed very rapidly by burrowing from animals or maybe from plant roots, etc." The newly discovered tools are small, and the researchers propose that they were designed for a mobile toolkit - something that could be easily packed up and moved to a new location. 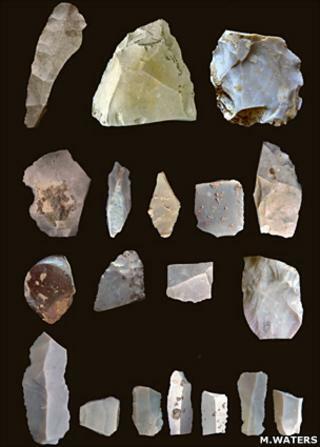 Although clearly different from Clovis tools, they share some similarities and the researchers suggest Clovis technology may even have been derived from the capabilities displayed in the earlier objects. "The Debra L Friedkin site demonstrates that people were in the Americas at least 2,500 years before Clovis," said Dr Waters. "The discovery provides ample time for Clovis to develop. People could experiment with stone and invent the weapons and tools that would potentially become recognizable as Clovis. In other words, [these tools represent] the type of assemblage from which Clovis could emerge." But anthropologist Tom Dillehay, who was not involved with the latest study, commented: "The 'Clovis first' paradigm died years ago. There are many other accepted pre-Clovis candidates throughout the Americas now." Professor Dillehay, from Vanderbilt University in Tennessee, told BBC News: "If you look at the prose of this paper, it bothers me a little bit because it's as if they are reconstituting the Clovis-Pre-Clovis debate and saying, 'Here's the site that kills it'." He commended the researchers on their well-presented data and "tight discussion". But he said that the OSL technique was less reliable than radiocarbon dating, which has been applied to other early American sites. And assigning the artefacts to Clovis and pre-Clovis technologies was not straightforward because the site lacked the projectile points required to reliably distinguish between the two. Clovis projectile points are unmistakeable. In addition, said the Vanderbilt anthropology professor, the tools come from a floodplain deposit that is just 6-7cm thick. This, he said, was "potentially problematic" because of the possibility that artefacts were transported around by water. Professor Gary Haynes, from the University of Nevada in Reno, US, praised the "good work" by the research team. But he said it was plausible that natural processes could have caused some stone tools to migrate downwards in the clay - giving the impression of a pre-Clovis layer.